* What Should You Do When Your Child Has Fever and Cough? Tips from local doctors specializing in pediatrics and emergency medicine about what to do when you have a sick child in your hand. It always seems to happen at 6pm. You leave your happy and healthy baby at the day care center in the morning, and at the end of the day, you have a fussy baby with a runny nose, cough, and fever. You immediately think "Where did this come from, and what should I do?" Because your pediatrician's office is closed that day, and you know you can't wait until morning to see a doctor, do you have to take your child to an emergency center or urgent care center? Or are you overreacting? As a parent of four children and a child emergency doctor, I can see both sides of the dilemma. Here are some thoughts to help you deal with the situation. 1. First and foremost, it is never wrong to take your child to the emergency department at any time. As an emergency room doctor during the day, I can tell you that is our goal. Believe in your parents' instincts. If you feel something is wrong, go to the emergency room or urgent care center - because you know the best for your child. 2. Once you get there, this is what you can expect: With children and fever, pediatric emergency doctors break children into three groups: 2 months and under, 2 months to 6 months, and 6 months and above. Grouping is based on the number of vaccinations children receive, with older children having sufficient protection against Street and H Flu and younger ones at increased risk of contracting this bacterial disease. For this reason, if your child is 2 months and under with a rectal temperature of 100.4 or greater, the baby automatically receives comprehensive treatment and spends the next two days in the hospital for observation. For children aged 2 to 6 months, children will receive training; however, if the lab results are normal, the child can go home with a follow-up close to their pediatrician in the morning. For children aged 6 months and above, the examination will depend on the child's symptoms and how sick the child is to an experienced pediatric provider. Don't be surprised if your doctor does a complete physical examination, feels that the virus is causing a fever, and sends you home without antibiotics. This is standard - and good medicine - because it reduces the chance of allergies, diarrhea and antibiotic resistance in your child. 3. About fever. Another question I often ask is how parents have to deal with a high fever. Worried parents often want to know, "If my child's fever skyrocketed to 104, what should I do?" I always convince parents that relatively high fever in young children is not dangerous because raising body temperature is a method of fighting infection. In some countries, in fact, doctors do not recommend using ibuprofen or acetaminophen because they want to let the fever take its course. In the United States, we recommend taking antipyretics (Tylenol or Motrin), which relieves fever and makes children and their parents happy. I usually advise parents to stay with Motrin for Tylenol (and not alternately) because the dose of Motrin lasts for eight hours while Tylenol only lasts for four hours. If your children are similar to me, my wife - also a doctor - and I try to avoid fighting drugs in any way, so we minimize the frequency of drug administration. When determining the right dose from Motrin, be sure to give a basic dose to your child's weight - not their age. Using the wrong table, it is very easy to reduce the dose of the drug, and even a small amount below the required dose based on weight will make the entire dose ineffective. If your child is under 6 months of age, do not give Motrin and discuss treatment with your pediatrician, ED doctor, or emergency care doctor. 4. What should you do when your child coughs? Know that coughing is a very common symptom associated with fever. This is often a part of the viral syndrome - but it can also be a sign of pneumonia. How can parents distinguish it? This can be difficult, so this is my algorithm to determine which child I will order a chest radiograph (to determine if the baby has pneumonia). Note: Although this criterion is not a difficult and fast rule, I find it useful to find pneumonia in children and at the same time help us not to do an over-order test. Does the child breathe well? Otherwise, their oxygen saturation may be low. 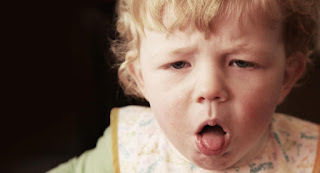 Has a child had a fever and cough for more than three days? If you answer "no" to the first two questions, and "yes" to the last and you think your child has pneumonia, call your pediatrician immediately or go to the emergency room or urgent care center. 5. Assuming your child does not suffer from pneumonia, the next question parents ask is: "So what should I do about this cough?" The reason that they are contraindicated for children under 6 years is that they are ineffective and have caused adverse outcomes - but especially in children. under 1 year. While there is no good or fast way to relieve coughing, I suggest that parents put vaporizers in the child's room, especially in dry, dry winters. And don't count old drugs like mixing a little milk with honey. In addition to convincing parents that coughing won't hurt their children, I told them only to monitor every symptom of pneumonia (see above).